Berkeley's Principles: Expanded and Explained includes the entire classical text of the Treatise Concerning the Principles of Human Knowledge in bold font, a running commentary blended seamlessly into the text in regular font and analytic summaries of each section. The commentary is like a professor on hand to guide the reader through every line of the daunting prose and every move in the intricate argumentation. The unique design helps today's students learn how to read and engage with one of modern philosophy's most important and exciting classics. 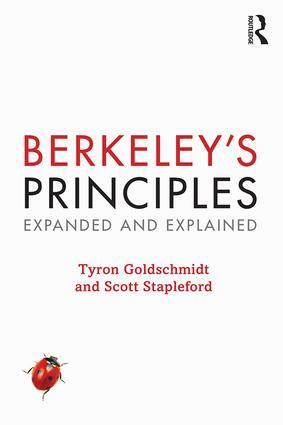 "Berkeley’s Principles: Expanded and Explained provides a unique, philosophically penetrating introduction to the Principles, one students and teachers alike will find exceptionally helpful and illuminating. Goldschmidt and Stapleford have done an admirable job of ‘translating’ and interweaving Berkeley’s text with insightful commentary in a way that clearly distinguishes Berkeley’s voice from theirs. Anyone exploring Berkeley’s ideas, anyone teaching Berkeley to undergraduates, would do well to give the book serious attention." "Berkeley's Principles is one of the most tightly constructed of all of the great works of philosophy. In consequence many of his key arguments are in danger of being passed over by all but the most attentive students. The present volume constitutes a vast expansion of the text by means of the insertion of commentary in amongst Berkeley's own words. This is a wholly original approach to the subject and the result promises to offer teachers of early modern philosophy an extremely useful supplement to more traditional forms of secondary literature." "Goldschmidt and Stapleford have produced a remarkable teaching resource. The style of commentary is innovative, and I expect it to be extremely useful in helping students develop the skills necessary to read a philosophical text." "With this book, the authors implement an exciting new method of making great philosophical texts more easily accessible to the reader, by infilling their arguments to attain the clarity and rigour characteristic of contemporary analytic philosophy. This feels like a virtual tutor guiding the reader through the work. In his Preface, Berkeley explains that it will take a ‘thinking reader’ to understand his book. No doubt he would approve of this new format which will enable many more students to become careful readers of this classic of philosophy and to appreciate the boldness of its metaphysical vision." "A novel idea brilliantly executed. I'm as excited as ever to read Berkeley with my students, now with his spirit as our unobtrusive guide." Tyron Goldschmidt is Visiting Assistant Professor in the Department of Philosophy at Wake Forest University. He is the editor of The Puzzle of Existence: Why Is There Something Rather Than Nothing? (2014), and the author of various articles in metaphysics, philosophy of religion and medieval philosophy. Scott Stapleford is Associate Professor of Philosophy at St. Thomas University, Fredericton, New Brunswick, Canada. He is the author of Kant's Transcendental Arguments: Disciplining Pure Reason (2008), and various articles in epistemology and early modern philosophy.